An open-source cloud storage and filesharing application. Securely synchronize your files to any kind of storage! The core team of Syncany is on hiatus for an indefinite amount of time. Feel free to do with the code what the license allows and encourages, but please don't expect any maintenance. The team thanks everyone who has contributed to Syncany in one way or another. 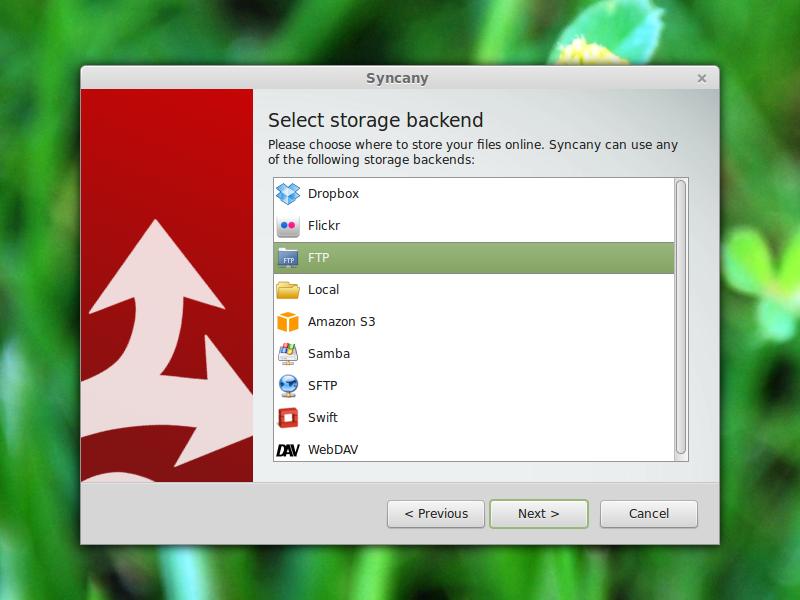 Syncany allows users to securely backup and share certain folders of their computers using any kind of storage. 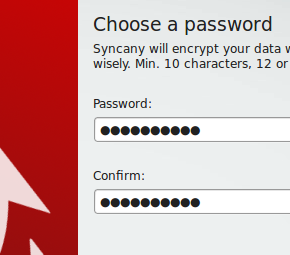 Syncany is open-source and provides data encryption and incredible flexibility in terms of storage type and provider. Backup your photo collection and share files with friends. Don't worry about your privacy. Files are encrypted before uploading. 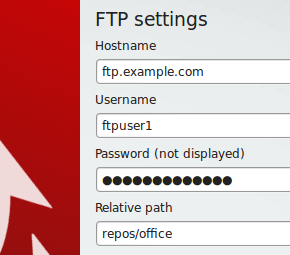 Use any kind of storage - (S)FTP, WebDAV, and many more! Excited? You can download a working alpha version here. Syncany is open source and distributed under GPLv3. To build it yourself, check out the code on GitHub. Once you've installed Syncany, try out the follow commands and check out our awesome User Guide! 13 Jun 2016: The core team of Syncany is on hiatus for an indefinite amount of time. Feel free to do with the code what the license allows and encourages, but please don't expect any maintenance. The team thanks everyone who has contributed to Syncany in one way or another. We might pick up development again, or we might not. Feel free to contact us via e-mail or IRC. 20 Jun 2015: We had a couple of releases since December. In version v0.4.1-alpha & v0.4.2-alpha we added a new 'Preferences' dialog to add/remote plugin and a copy-link feature in the GUI. With version v0.4.3-alpha, we released our first Mac OSX version, added a history browser to the GUI and made plugins updatable. For version v0.4.4-alpha, we rewrote the Syncany API on the website, added 3rd party plugins and update checks for the application and plugins. In version v0.4.5-alpha, we added automatic OAuth token handling, added optional transfer manager features, added a default .syignore file, and much more. In all releases, we also fixes countless bugs! Check out the releases page for more details. 28 Dec 2014: We've reached another milestone. The Syncany core feels more stable by the minute. We released v0.2.0-alpha, v0.3.0-alpha, v0.4.0-alpha, with v0.4.0-alpha being the best release we have ever had. 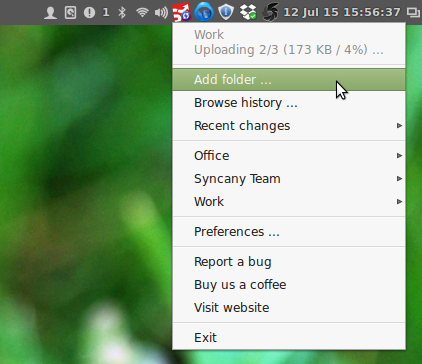 The GUI (tray icon and 'New folder' wizard) works quite well. You can see it in action on our YouTube channel. We also made a couple of new plugins for Flickr (encode data in images, video here), Dropbox, OpenStack Swift and RAID0. Beta is just around the corner! Older news are available in the news archive. Enough with the marketing. Here's how Syncany looks in the wild. 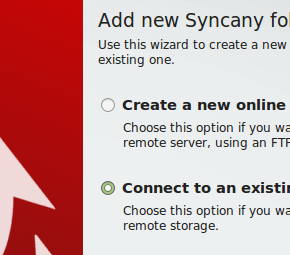 Syncany in action: Creating a new repository, connecting to it and syncing files with the graphical user interface. 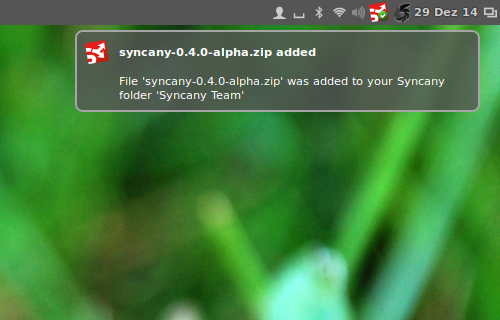 Tray menu always keeps you up to date - for all of your sync folders. 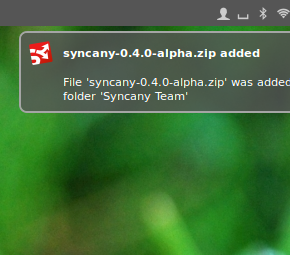 Notifications let you know when other users have added, changed or deleted files. 'New folder' wizard makes creating new repositories and connecting to existing ones easy. 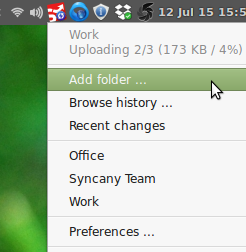 Multiple sync folders Syncany lets you sync any (get it?) folder, not just a single one. Any backend storage, without having to worry about your privacy. We encrypt before uploading. 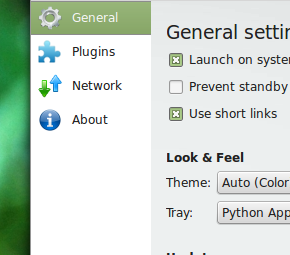 Relevant settings are displayed depending on the storage backend. 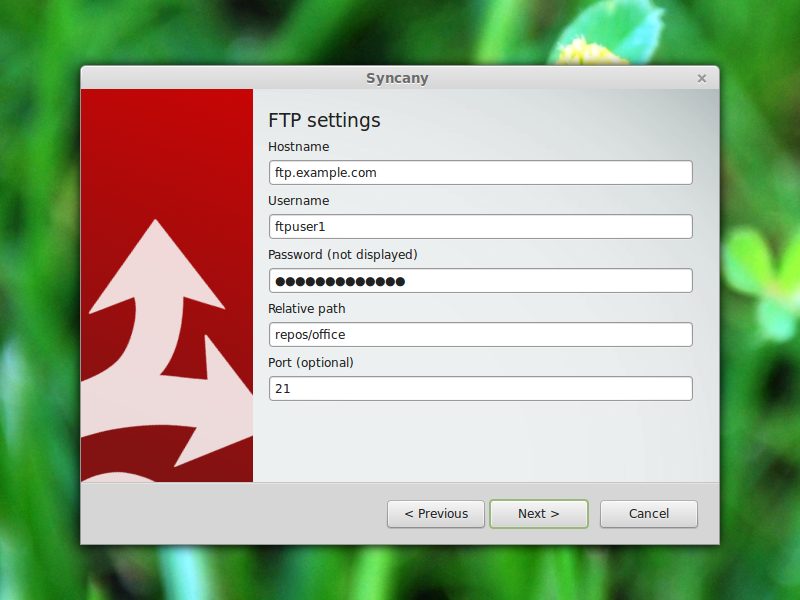 Symmetric encryption of files before upload, with AES-128 and Twofish-128. 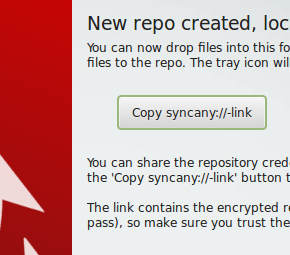 Share a repo among friends and colleagues via a syncany://-link. 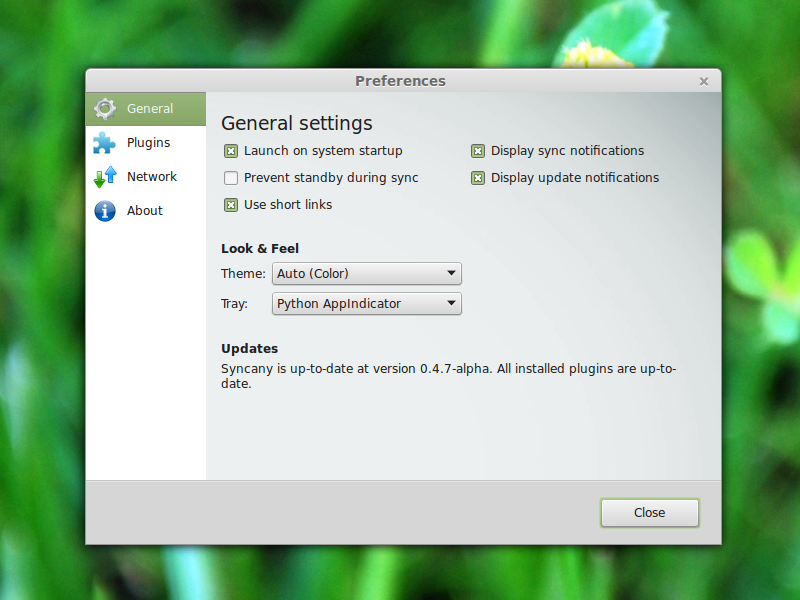 Configure general settings in the 'Preferences' dialog. Extend Syncany by installing storage plugins. 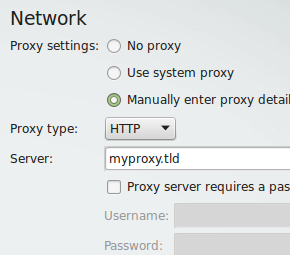 Use a proxy to connect to your repo behind a firewall. Creating a repo via CLI is very fast with the sy init command. Connect to a repo via CLI from other clients and sync files manually with sy up and sy down. Still no idea what we're talking about? Check out the User Guide! Want to help? Or just build it yourself? For information about building, development, documentation, screencasts and diagrams, please check out the source code and the Syncany wiki page. It'll hopefully give you all the information you need! If you're not in a position to help out but you still want to support us, you can buy us a coffee or a beer. Original website template by w3layouts. Thanks for the love!